I am trying to present what I learnt today on MVVM pattern with an example and comparative study on legacy code and MVVM Code. It goes with an assumption that readers has experience with WPF. This design pattern is used for WPF /Silverlight kind of application. 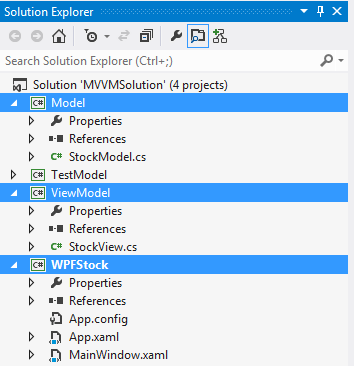 As WPF supports Bindings, Commands and Data Templates, MVVM best suits to this technology. View – View provides visual representation of the data that is been passed from Model. ViewModel – This acts as a connector between Model and View. We will now look at an example to understand more on how we can implement MVVM pattern in our applications. Scenario: You need to develop an application which will show color coding for available stock. Your UI should have 2 buttons, Textbox and a label. Textbox should show the available stock, label should show the color coding. Two buttons should read as Increment and Decrement and perform stock increment or stock decrement actions. In General if we develop this in normal ASP.Net web application, we get the stock count from Business layer to the UI and check the count. Based on the count you define the color coding as defined in the requirement. By doing so you are tightly coupling UI and the logic. So you will end-up writing lots of code in Codebehind file of the view. Using MVVM pattern, we can easily move this code in to a ViewModel class and de-couple view and the logic. Create three different projects as shown below. Create a class library and name it as Model. Rename the existing class as StockModel.cs. Now open expand ViewModel project and open StockView.cs and copy paste below code into it. Below StockView class implements INotifypropertyChanged. This is because, we moved the logic form View codebehind to a saperate class called stockView. INotifyPropertyChanged interface is available in System.Component Model name space, so this need to be imported into the solution. This is used to notify the view as and when any property gets changed. As said earlier, ViewModel acts as the connector between View and the Model, we need to define properties and Methods which can bind to the controls on the UI. We have a label, textbox and two Buttons on the view, so we need to create two properties to bind label color and content respectively. Another property to display stock count in the textbox. Two methods to respond to button click events. When we separate View and Model, we even need to capture button click events in ViewModel. To do so we need to utilize commands feature in WPF. These are derived from ICommand interface with two methods CanExecute and Execute. If you look at below code we declared Icommand instance and passed Actions (also called as readymade delegates) with pointer to the target function. Now to allow these binding, we declare Propertychanged delegate and define refresh method as shown in the below code. This method will notify changes in the property values to the view and allow user to see the latest value. btnClass definition: In this class we define a constructor with multiple Actions or an Action collection. Based on the command parameter we invoke respective methods. Once namespace and resources are defined, we need to create binding using properties for each control. As a sample I have shown here how to configure binding for a control. To conclude, Using MVVM pattern, we completely avoided code behind for the View. We were able to define all methods in View Model and Logic in to Model classes. Now our View is independent of the logic which enables us to add new Views and define their control in the View Model classes. Posted in Design Patterns, MVVM, WPF.Tagged DesignPatterns, MVVM, WPF.